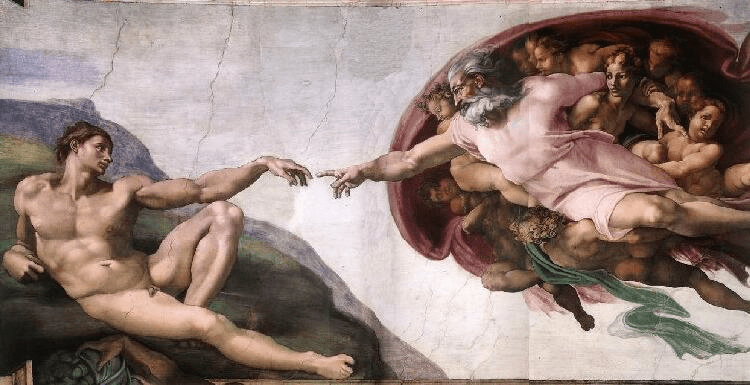 Here Michelangelo depicts God breathing new life into dead meat. If plot is the skeleton upon which the meat of your story hangs, then characters are surely the heart and soul. Characterization is the art of presenting the people who populate your story. Characterization is, in essence, nothing more — or less — than the depiction of motive (a word, incidentally, that comes from the Latin movere, meaning “to move or act”). Thus it is primarily through actions and speech that a character’s traits are disclosed — which is why the act of compendiating in narrative passages a character’s thoughts and feelings do not alone develop character, though these passages do help, and telling, as opposed to merely showing, does have a legitimate place in storytelling. Algernon: Good Heavens! Is marriage so demoralizing at that? Algernon: (Languidly.) I don’t know that I am much interested in your family life, Lane. Just as in real life humans are evaluated by what we say and do, so in literature characters are also defined by what they say and do. But what, finally, defines a character’s words and deeds? What, for that matter, defines our words and deeds? Only when we understand why a person does what she does do we begin to understand that person. And we understand someone well only when we understand the motives behind her actions. Yes: it is ultimately thought (or non-thought) that defines deeds, and thoughts, as we recently discussed, are shaped by words. Literature is the artform of language. Literature is the artform of thought. Character, both real and fictional, is determined by how thoroughly the author examines the thoughts that make the character act in the way she acts — and we are each the author of our own soul. The deeper the author delves into motive, the deeper we understand the character, and the more enriched our understanding of the human heart. “Only when we understand why a person does what she does do we begin to understand that person. And we understand someone well only when we understand the motives behind her actions. I’m curious if you find, as I do, there’s a tendency as a writer to do this with other people as well? To almost relentlessly seek out the motives behind other people’s words and actions… to feel that understanding them is the only way to genuinely know them? There is that tendency, yes. Understanding, I believe, is necessary to knowing. Sorry your comment got held up in moderation. This Akismet spam filter is too aggressive, and I’m not quite sure what to do about it. Thank you for the articulate comment, and thank you for dropping by.